As members of this community, we owe a lot to our friends over at Fort Houston! Fort Houston is a membership based facility located in the Wedgewood-Houston neighborhood of Nashville, TN. It is home to many artists and artisans working with a variety of skills and mediums, and has been featured in multiple magazines and websites worldwide. The Fort houses a full scale wood shop, metal studio, screen printing shop, 3D printing lab, mechanical shop, and photography darkroom. It not only provides the large scale tools and space that is needed by many of Nashville’s maker class, but is also a place for both hobbyists and professionals to learn, grow, and network within their fields. Each month Fort Houston opens its doors to the public on the first Saturday’s “Arts and Music at We-Ho” art crawl. The gallery changes monthly, and has become a place for both local and travelling artists to showcase their work to their peers in a more “laid-back” environment than is usually found in traditional galleries. If you don't know of Jimmy or his beaut of a shop, @motomodashop listen up! Leaving behind a corporate job in Indiana, Jimmy made the move to Nashville 3 years ago & Moto Moda was born. 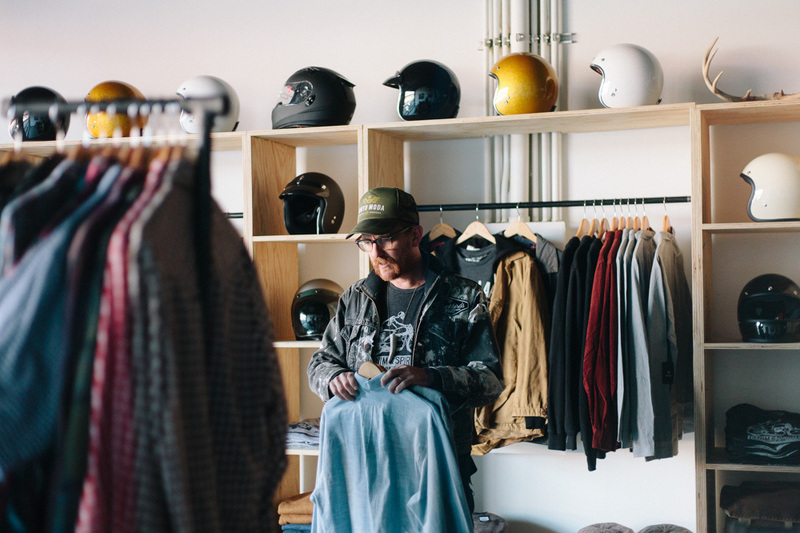 Beginning as a pop-up shop housed in a 1972 Airstream Argosy and featuring carefully selected brands, vintage apparel, and motorcycle accessories, Moto Moda now has a permanent home at 521 Gallatin Ave.
A recent addition to the @blackbirdsassembly, Jimmy continues to foster community & make sure everyone around him feels like family. So go swing by the shop, throw on a record & tell him we say hey! You'll never want to leave. "The Blackbirds are a collective of creative individuals brought together by their enthusiasm for motorbikes and the passion for the life these machines tend to magnify."